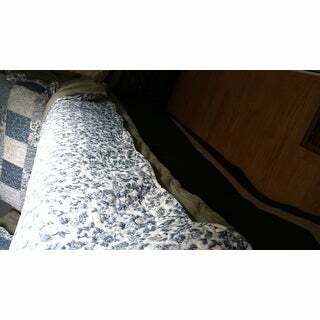 I actually kept this quilt. I was going to send it back but it is too damn good looking and super reasonable. I LOVE overstock. I really do. They have worked with me on things and I will always come back here. Really! These luxury Bedspreads are a lavish and chic addition to the Blissful Living line of products. A beautiful mix of modern and vintage these patterns are full of gorgeous flowers and plaids. Blissful Living is a brand bringing the finest quality and designs to all items Home from the bedroom to the kitchen to the bathroom to the living room the blissful living line of products will be the optimal choice. All our products that fall under the Blissful Living name need to live up to a certain standard of quality that customers from all walks of life will appreciate and enjoy. Shell 100% Polyester, Fill 100% Cotton. 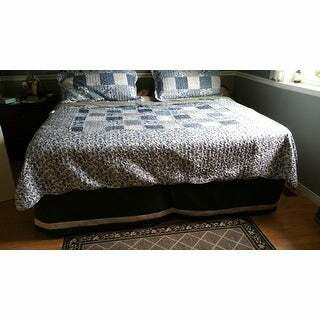 Twin and Full/Queen Come with standard pillow Shams size 20 x 26. 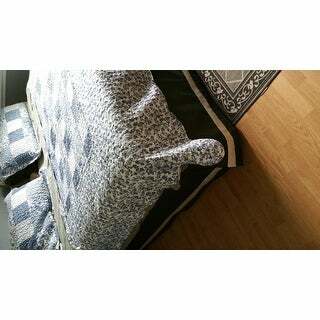 King set comes with 20 x36 size shams. BRIGHTEN YOUR ROOM: Replace your winter comforters and blankets for a bright and floral pattern bedspread that is sure to bring a summer feel into your room on even the gloomiest of days. GREAT VALUE: We believe in being priced right and giving our customers a great buy. These quilts are perfect for boys, girls, kids, teens and adults. EASY CARE: Machine wash cold, gentle cycle, only non-chlorine bleach when needed. Tumble dry low. Good quality, prettier in person. Using for a guest bedroom. This quilt is not heavy and exactly what I was looking for. Price was comparable to other websites. Very pretty, too small for a King bed. It may work for a smaller bed, but the square does not cover a king size bed at all. It is a shame because the colors and everything else is beautiful. 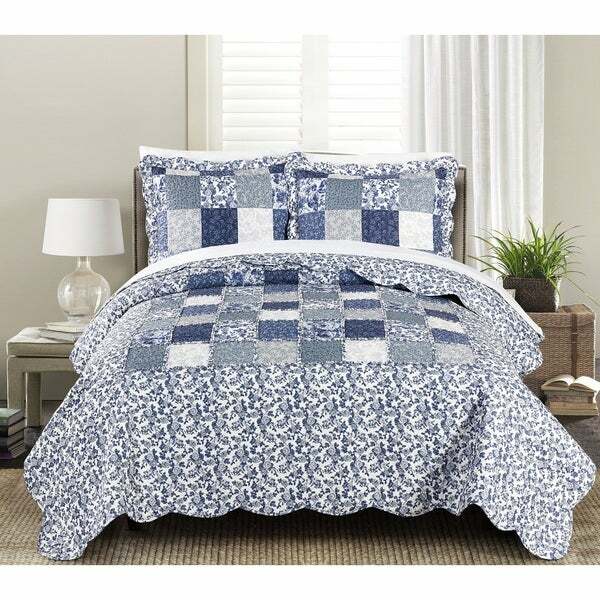 Beautiful Quilt Sets at a fantastic price! I bought two sets of these quilt sets in twin size for my guest room in my log cabin and they look absolutely wonderful. Great quality, not too thick and bulky which is just right for my guests. The colors are true to the picture. You will not be disappointed if you order this fabulous set! Set is a perfect color and great quality for the price especially! The size is exactly as advertised and the shams hold the larger king pillows. This set is absolutely beautuful. The colors are really pretty and the quilt is made well. The shams however, got really mis-shaped after only washing once using instructions on tag. Christmas present for my Mom- she loves quilts and blue. Came very fast and is very good quality. She lives in Louisiana and this is the perfect mid weight for the southern weather. I wasn't sure how much to hope I'd love this quilted bed set with the price being so reasonable, but it's PERFECT! I love it! 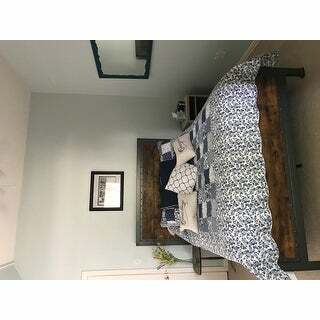 I bought it for our blue guest room and it looks great!!! Absolutely love this quilt it's beautiful!! The colors are very vibrant. I research this quilts price and found that overstock was the cheapest for the same quilt other store's we're selling it for. Pretty quilt but fabric is polyester . I'm using these to cover the furniture due to our darling pets. So far I've washed them at east three times and they are holding up great, really happy with the look plus they are reversible, what a steal these were. Thank You Overstock ! This is beautiful. Cant wait to put it on the new bed i just ordered from you. Im moving and it will look great in my new home. It looks just like it is pictured and is of very good quality! I would recommend this to anyone. It provides warmth without being heavy on top of you. "Is the quilt background a true white or more of an ivory?" It is more of a true white tone.